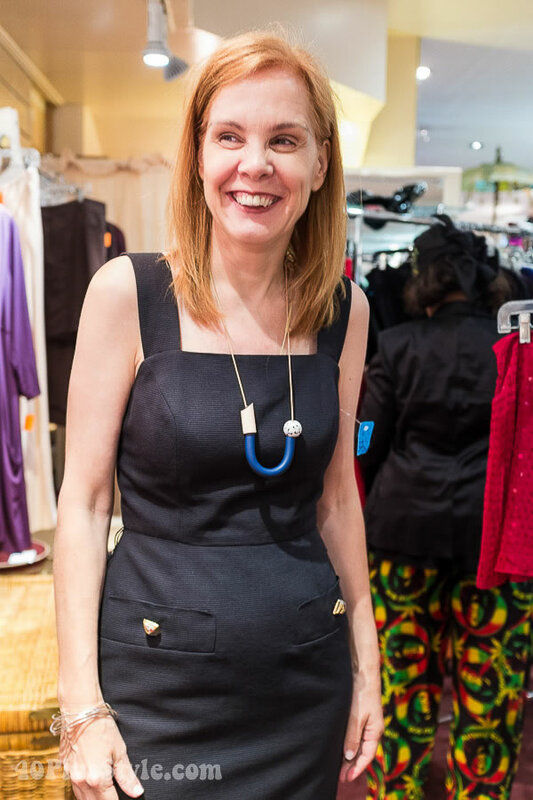 One of the things I had looked forward to while visiting New York was to shop in its fabulous consignment shops. 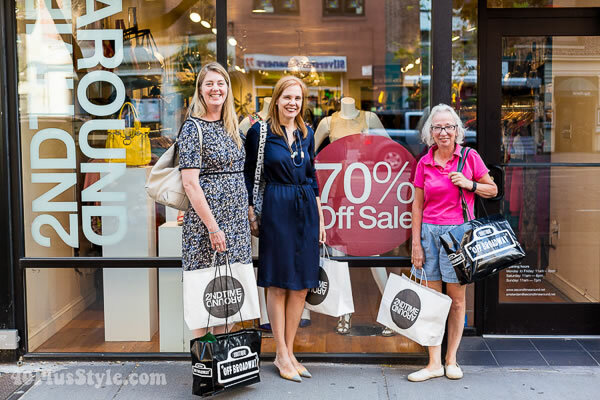 I had heard that it was so much easier to find high quality consignment finds in New York than anywhere else and that turned out to be the case. The prices are not super cheap though. Don’t expect to find many designer items under $50 in these stores. For cheap bargains you need to browse through the many thrift stores which tend to be a lot bigger and messier. I prefer the nicer consignment shops and if you are looking for high quality designer items at much reduced prices when compared to retail, then consignment stores offer a large assortment of good options. 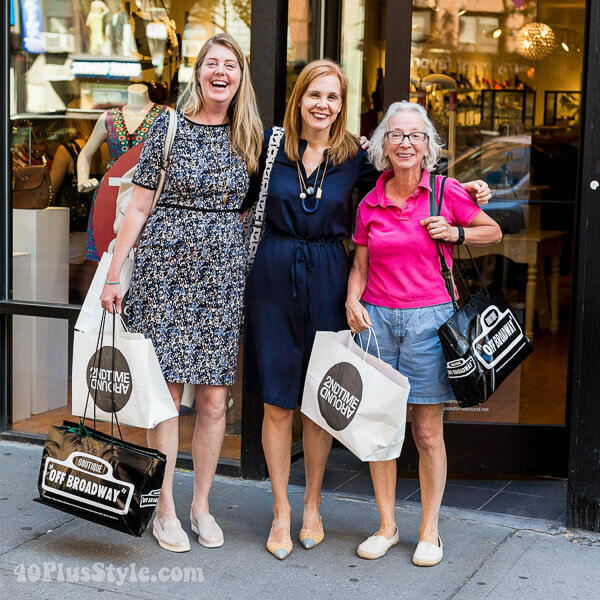 I believe I found some of the best consignment and resales shops in New York and here is my list of recommendations for you. This was one of the first consignment stores I visited and it may possibly also be one of the best. I came here with Lorraine and Elle from the blog My Daily Costume. The store has quite a few rooms and clothes are sorted by item and by designer brands. I ended up buying 3 silk dresses here and one pair of Prada shoes for $75. I bought the silk blue Theory dress of the top image in this store. You have already seen the red dress I bought here as well. I have not yet featured my third dress, which is by Sonia Rykiel. Elle bought a few pieces too as did Lorraine. I featured the fabulous pink coat she bought here. 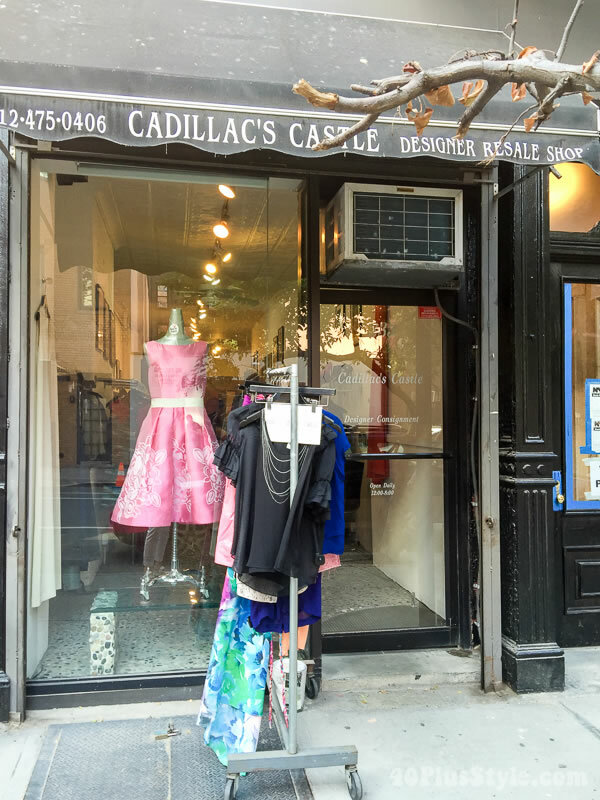 This is another good store on the Upper East Side with lots of designer clothes. Although I was tempted by a few items, I did not buy anything as prices tended to be quite high. This is another store where I bought a few items. 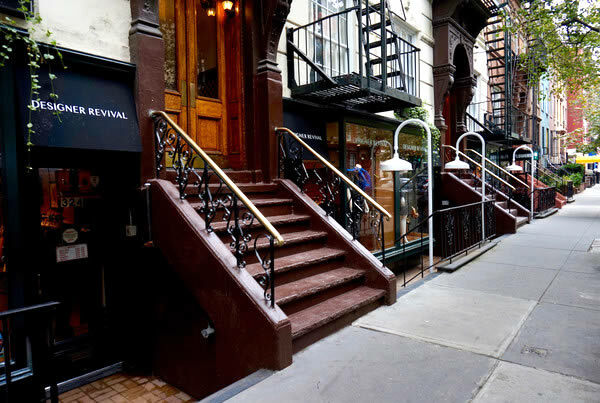 It’s a little bit more affordable than the shops at the upper East Side and there are fewer designer brands. I liked that the clothes were both sorted by size and function (tops, buttoms, dresses etc.). I love to wear dresses in Singapore so I always check out at that rack first. I was there with my friend Saskia and 40+ photographer Denton (who took the below pictures) and his wife Teresa. Here are a few things I tried on and did not buy. Saskia looked great in this dress. I like the print and fit of this one but was not happy with the fabric so left it in the store. I quite liked this top but had to make choices in the end. Couldn’t buy it all! This silk blouse was fab but just a little too tight. 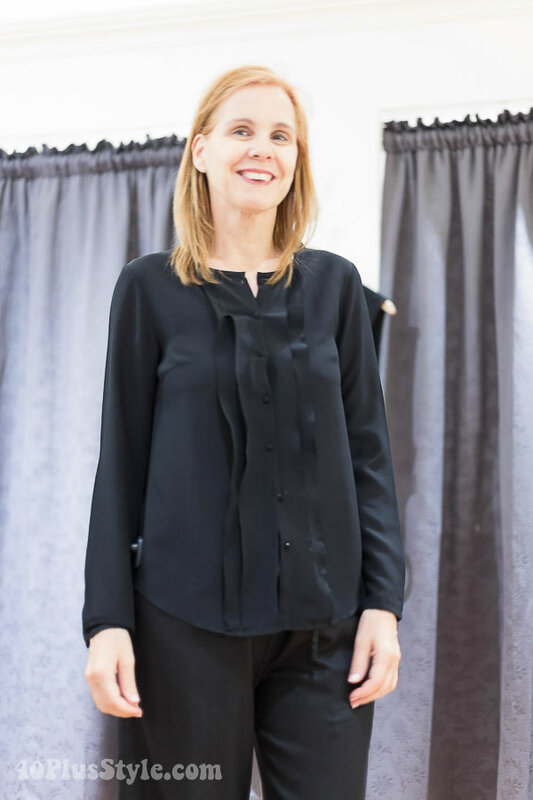 One of my favorite purchases from this shop is my Parker silk black and white top which I featured in this article. I also purchased items from Steven Allen, Funktional, Philip Lim and Gemma. Details: this shop has branches in several locations. I visited the branch at 238 West 72nd Street, New York. This was the famous boutique by the fabulous Lynn Dell whom we featured here. Sadly both she and her husband passed away and I believe the shop has closed down even though the website is still operational. Perhaps someone will continue the legacy of Lynn. I tried on this fabulous dress that I really liked but sadly it was too tight. Denton really liked this jumpsuit on me. I concede it looks pretty hot in this picture (it had an open back as well) and the flamboyant lady of the shop encouraged me to buy it. However, I felt like a disco queen in it. The synthetic fabric showed every bubble on my body and I just knew I would never wear it (except to a 70s dress-up party!). I did walk out the store with super cheap black silk pants though. 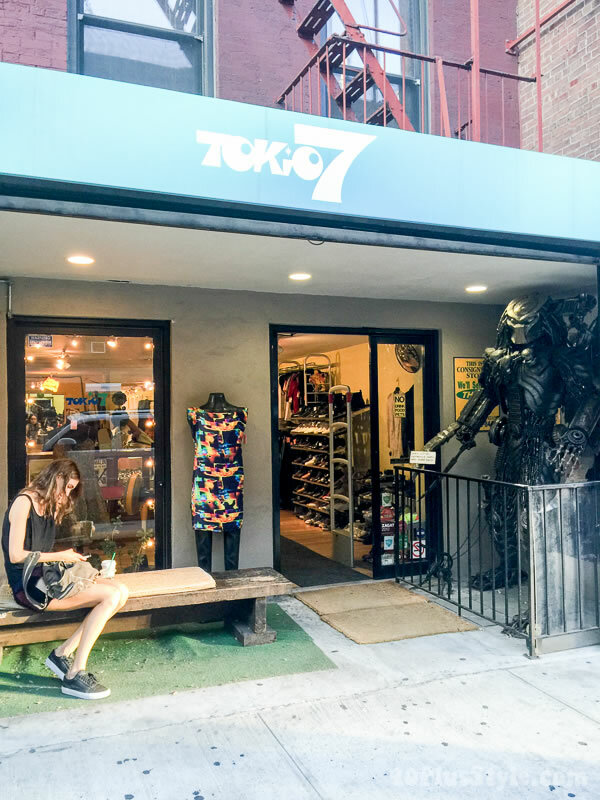 The East Village is known for its many consignment and thrift shops. Another great store with a lot of designer items. They stocked lots of items by Helmut Lang and other designers. It’s a surprise I did not buy anything here, although I did try on a few items. Since I shopped here at the later part of my stay in New York, I had become super picky. Items needed to both fit me and my style perfectly! This was a beautiful little shop with a lot of real vintage items. The shop is especially good for hats. The Idiosyncratic fashionistas introduced me to this store on the day I interviewed them (read the interview here). They were hoping to find me a hat. So was I, but unfortunately no luck. When I was in the area again with friend and blogger Suzanne I stopped by to have another look and bought vintage blue sunglasses instead. You can see them here. This shop has a huge collection of vintage eyewear as well as a good collection of hats. 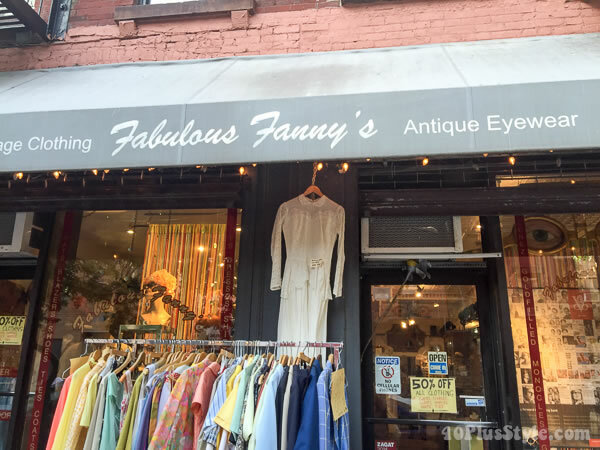 Details: 335 East 9th Street (between 1st & 2nd Avenue), New York, N.Y. 10003, phone: 212-533-0637 , email: fanny@fabulousfannys.com. This was a fabulous little store full with designer brands and clothes in immaculate condition. There were a few things I liked but they looked too much like things already in my closet or bought in New York previously. Suzanne almost bought a Burberry jacket. Definitely a must-see on my next visit to New York. This is not a consignment shop but I have included it into this list as it does offer items from top brands at reduced prices. 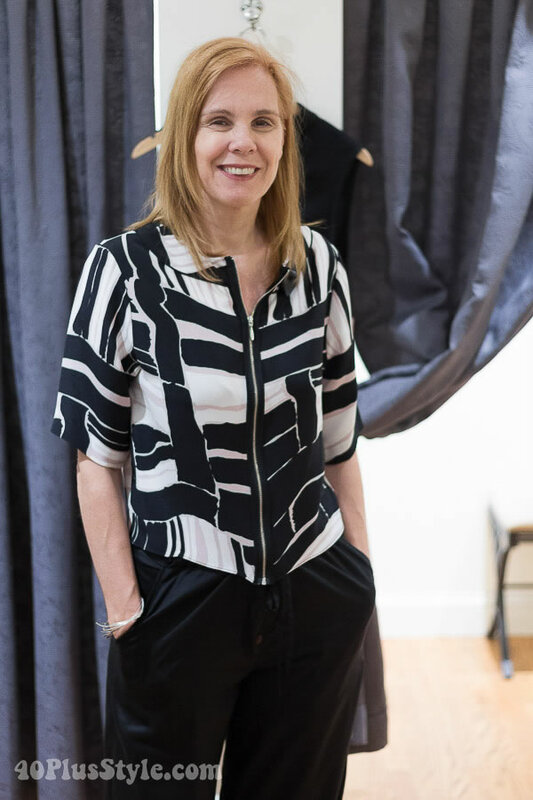 This shop was recommended by Lyn Slater, aka Accidental Icon and offers an edited collection of designer’s work from the 50’s and 90’s to include Lanvin, Cacharel, Chanel, YSL, and Ungaro as well as Avant Garde Japanese designers such as Junya Watanabe, Commes des Garcons, Rei Kawakubo, Yohji Yamamoto and Issey Miyake. They also store a selection of authentic mint and unused Chanel handbags. This store is not cheap but the rates are a lot better than full retail prices. Unfortunately, I came there when the summer collection had already been stored so the shop was full of thick woollen clothes, especially by Commes des Garcons. If I ever come to New York in the winter I know where to shop! They did have a few summer pieces left though and I bought a short cotton dress / tunic by Marni as well as a silk dress from Ann Demeulenmeester. 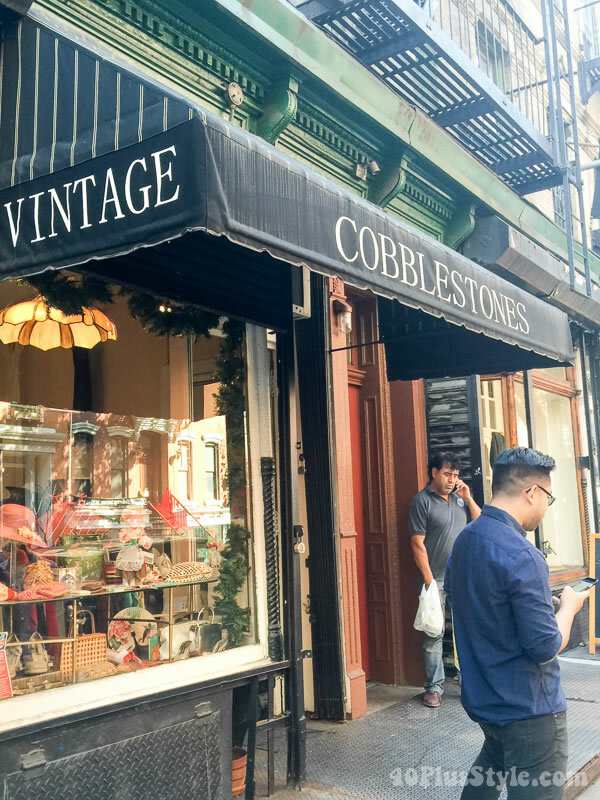 Soho is mainly known for its many retail stores but I also visited a few consignment stores. One of the best is Housingworks Soho. It’s not super cheap but they had a good variety of vintage pieces as well as more modern clothes. This is where I bought my Theory white pants which I featured here. Would love to have your recommendations too! There are so many great shops in New York that I could not possibly see them all. However, I did get some good recommendations and these consignment and resales shops are definitely some of the best. I would love to receive your recommendations too so I can add these to the list. 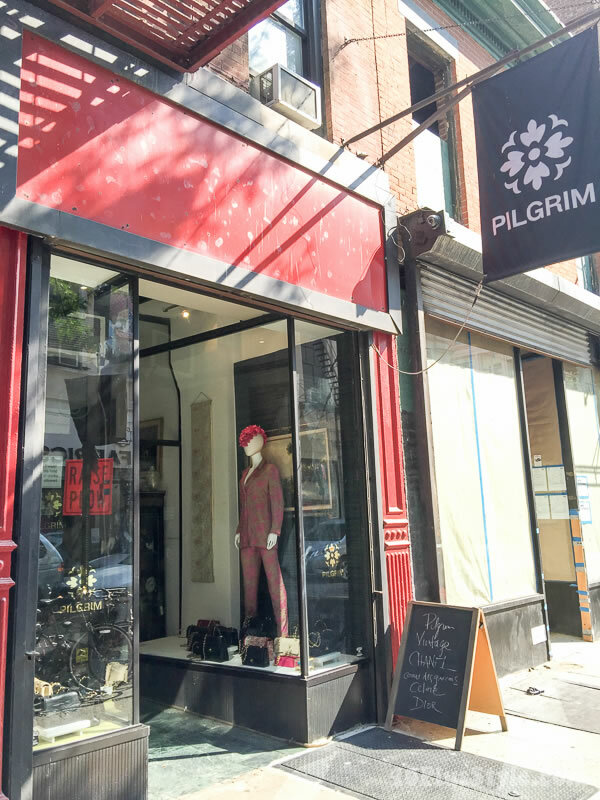 Please list your best consignment shops in New York in the comments. Wow. That is a friggin’ shame about the red jumpsuit! But you knew I’d say that. We could have been jumpsuit twinsies! Also a shame about the dress that was “too tight”. You did manage to get some great pieces and have now discovered so many great shops to return to in future visits. 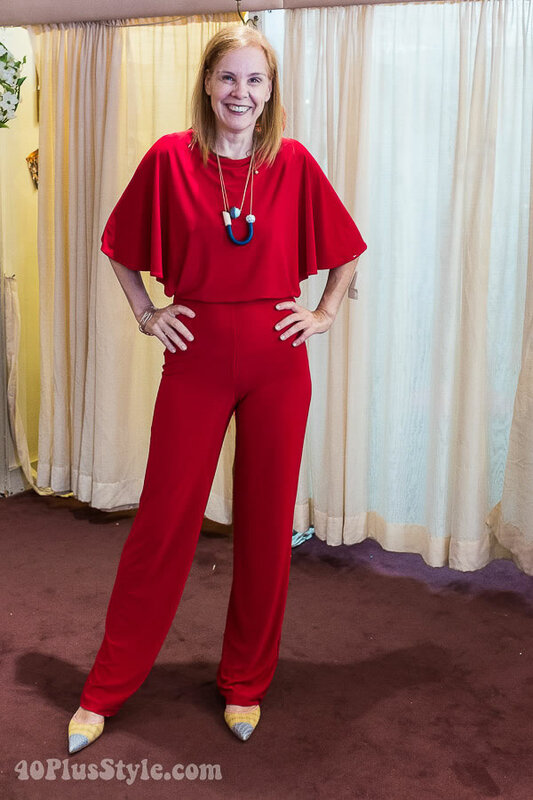 Yes I want all 40plus readers to tell Sylvia that she should have bought that red jumpsuit! Lol. As hard as it may be to believe there are many more shops than those listed above. Sylvia I will send you more names later. We’ll see. I asked opinions on Instagram and Facebook but I’m still happy with my decision. Oh yes such a great time. I miss New York already. Will be back! Designer Revival was a fabulous shop and I am grateful to Elle for taking us there! As well as my pink coat that Sylvia featured I bought a Michael Kors dress and Nanette Lapore dress which fit beautifully and, so it turned out, were consigned by the same person. Did you wear it yet? Be sure to upload pictures in the facebook forum! Sylvia, I have yet to wear the items I bought but always looking for the right opportunity! Oh you’ll have so much fun Suzanne. Enjoy! Okay, you already left the red jumpsuit behind, but couldn’t you have worn that blue and white Kenzo tunic thing on top for daily wear, to de-disco as the professionals say? Heh. Great list of shops, Sylvia. Someday I hope to check them out! The fabric was the main issue. It was thin and synthetic. I also feel that a jumpsuit should shine by itself… Start saving up for 2 years from now. I plan to be back in 2017 and would love it if you joined me then! First time on your site …. I live in Northern NJ so have been to some of these stores. Did Designer Revival used to be Designer Resale? Yes that’s right. They seemed to have changed their name in the last 3 months! What a great list. I would have LOVED to be there with you. I knew from Elle that the consignment stores in NY were so much better than the thrift stores here in Holland. The red jumpsuit does make you look hot! I showed your IG picture to a colleague and said: “look at this amazing figure!”. You say it showed every lump and bump. But the photo doesn’t show that. Nevertheless I know you are picky on fabric so it is good you didn’t buy it. Besides you found enough good stuff. Those shoes you are wearing with the lovely blue dress are nice too. Yes you would have loved it. So much choice and many good brands. I hope you will join me in 2 years time. It really did. The fabric was synthetic and thin. You would need to wear shapewear underneath! And of course I was holding my tummy in! Previous post: Streetstyle inspiration: 70s Style – Which of these 7 looks is your favorite? Next post: What is Retinol and How Can It Help Your Skin?